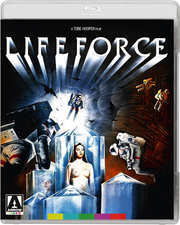 Bored with setting movies solely on earth, American horror maestro Tobe Hooper turned his attention to space with 1986 feature Lifeforce, and from 30th September you can own it on Blu-ray courtesy of Arrow Films. Starring Steve Railsback, Peter Firth, Frank Finlay, Mathilda May and Patrick Stewart, this as based on Colin Wilson’s novel The Space Vampires, and co-written by Dan O’Bannon. Now, you can't please all of the fans all of the time, but my goodness Arrow Films are trying. Firstly, the standalone Blu-ray release will feature a reversible sleeve containing the new and original artwork for the movie, so you can pick and choose. You also get both the international and theatrical cuts, transferred from original elements by MGM supervised by Tobe himself. Either Stereo or remastered 5.1 DTS-HD soundtracks, an isolated music score and effects soundtrack, subtitles for the hard of hearing, a director's commentary track, visual effects commentary track, make-up effects commentary track, Cannon Fodder: The Making of Lifeforce documentary, interview swith the director, Mathilda May, lookback on his career with Steve Railsback, trailers and collector's booklet. Presented in it's original 2.35:1 aspect ratio, the runtimes are 106 and 101 minutes for each of the respective versions, expect recommended retail prices of £19.99 for the standard release, and £24.99 for the steelbook. When a space shuttle crew finds a mysterious spacecraft containing three human-looking creatures in a state of suspended animation, they bring them back to Earth for further investigation. It's only then that scientists discover that they are in fact a race of space vampires that feed off people's life-force rather than their blood. So when they escape and run amok in London, the consequences are apocalyptic - and the shuttle crew's only survivor seems to be the only man who can stop them.